September 12, 2014. TOKYO – Nikon Corporation is pleased to announce the new D750, the latest Nikon FX-format digital SLR camera. Featuring a 24.3 megapixel digital sensor, it shares superior rendering capabilities and latest technology from the D810 and D4s to deliver the ultimate action camera. 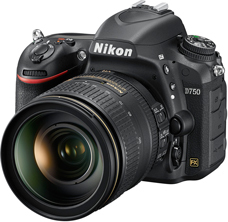 The D750 builds on the concept introduced in the D700 to provide pro-level performance in a compact package. Its 51-point AF system with 3D tracking with face recognition assure acquisition and tracking on moving subjects. Dual high speed SD memory card slots provide continuous backup or extended storage. Magnesium alloy is used in the camera body to reduce weight increase durability, while extensive weather sealing is employed to shield against dust and moisture. The D750 offers high-speed continuous shooting at 6.5 fps* with AF and AE tracking. To reduce vibration and enhance durability, Kevlar/carbon fiber-composite material is incorporated the shutter unit and has been tested through 150,000 cycles. With an incredible 50 to 51,200 extended ISO range, the D750 captures both high and low light subjects under the most challenging conditions. With AF detection down to an impressive -3 EV and select cross-type sensors functional at f/8, the D750 can use Nikon 1.4x, 1.7x or 2.0x tele-converters with autofocus using a full range of NIKKOR lenses. The D750 has been optimized for movie recording. Offering frame rates of 24/25/30/50/60p at 1920 x 1080 HD resolution for smooth movement and stabilizing exposure levels. The new EXPEED 4 processing engine reduces noise and delivers rich tones for stunning detail. * Measured in accordance with CIPA guidelines.